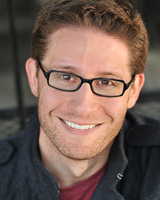 MARC GINSBURG – A Philadelphia native and New York transplant, Marc is proud to be a part of Musical Theatre Guild. Marc toured the country for a year and a half as a member of the Ensemble in Cameron Mackintosh’s OLIVER!, where he also understudied Bill Sykes, Mr. Sowerberry, and performed the role of Fagin. Favorite regional roles include Sir Lancelot/French Taunter/Knight of Ni/Tim the Enchanter – SPAMALOT (3D Theatricals), Che – EVITA (Cabrillo Music Theatre), THE COMPLETE HISTORY OF COMEDY (ABRIDGED) (Falcon Theatre), 18 different characters as The Man – REAL HOUSEWIVES OF TOLUCA LAKE (Falcon Theatre), Aaron – FIRST DATE (McCoy Rigby/LaMirada), Foreman/Lesgles – LES MISERABLES (McCoy Rigby/La Mirada)Lord Farquaad – SHREK (Moonlight Amphitheatre), Lawrence Jameson – DIRTY ROTTEN SCOUNDRELS (Glendale Centre Theatre), Quixote/Cervantes – MAN OF LA MANCHA (Glendale Centre Theatre), Leo Bloom – THE PRODUCERS (Norris Theatre), Billy Bigelow – CAROUSEL (Sierra Repertory Theatre), Harvey Fierstein/Mandy Patinkin/Colm Wilkinson/etc. – FORBIDDEN BROADWAY (Cosmopolitan Cabaret), Artie Green – SUNSET BOULEVARD (Musical Theatre West), Walter – LET’S MISBEHAVE (International City Theatre), Perchik – FIDDLER ON THE ROOF (Bucks County Playhouse), Fuentes – KISS OF THE SPIDER WOMAN (Vortex Theatre, where he met his beautiful wife), and many others. Please visit www.marcandliza.com and follow him on Twitter at @m_ginsburg!